Happy Birthday to me in a month! I think we may be getting close to finding a venue! A lot of places in New York are either closed down (due to the economy), too big of a club, too selective at the door to invite a lot of friends, have a crazy cover charge, or play womp womp music. This process has taken me a while but I checked out a venue last Friday that I LOVED and I'm just waiting for the Manager to confirm that it's available. It's beautiful. It's a private room on the second floor of this New York boutique hotel. Fingers crossed! We've almost got everything off the check list. The invites (via facebook and word of mouth) have been out and all we have to hope is that it works out with zero drama, hehehe. I love Aaliyah. If you couldn't already tell ... I adore her. I already wear my hair a lot like her straight hairstyle. I love her style, I love her music! This is one of my favorite looks from her. I love the wavy style of this hair do, I don't like tight tight curls so this wavy look is what i'm going for the night of my Birthday. Let's hope my hair stylist can get this right. 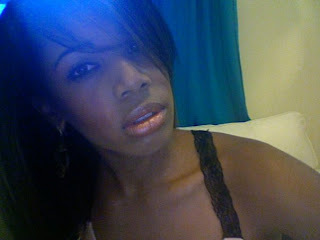 I usually wear my hair super straight but it will be nice to have some body to it to create a little drama. is exactly what I want to do for my Birthday. A strong dramatic smokey eye and a really cute lip color. I will say ... it's a dress! but not revealing it just yet, you'll have to wait until the day after to find out. 22 comments on "The Birthday Update"
I love that make-up. It's hot. And I can't wait for the dress! you work that makeup girl ! loving it very much ! i like your ideas allready! All the best for the party! Have fun! Love the makeup gurrlie.. you shud def do this for your bday.. I follow you check out my blog plz and twitter. wish you the best for your party! and Aaliyah's hair styles are amazing! Lovely make-up, I love it so much!! You look so pretty girl! 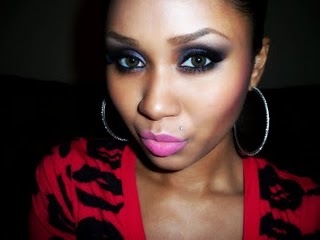 Love the bright pink lipstick & the smokey eyes, perfect choice! I love Aaliyah too..Its just so sad she die so young..U look gorgeous darling..